The Frank Building was located between the old 1st National Bank Building and the alley just south of the Soo Line Depot. The Frank Building was the home to Cox’s Bakery. 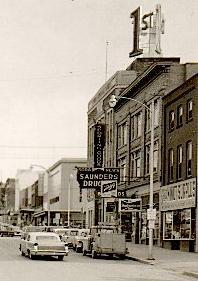 Before that this was also the home to Saunder’s Drug Store and at one time the North Main Tavern and Billiards. I believe the common name for the pool hall was The Hole. First National Bank bought the property and had the building torn down to make more room for parking for their customers. The site was turned into and still is a parking lot.